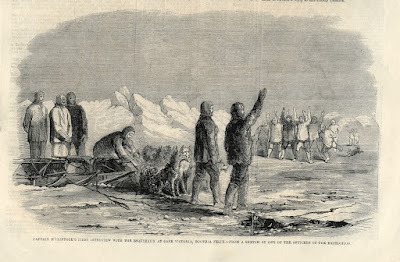 VISIONS OF THE NORTH: Inuit testimony about HMS "Terror"
To those who have expressed skepticism: It should be noted that when the Breadalbane was first found, the guy monitoring the side-scan shouted "There's her hull! She's intact! Even her masts are still standing!" Only later did they see the damage where the ice had sliced in. These bomb ships were incredibly strong with hulls that were several feet thick. Breadalbane appears to have been a tea cup by comparison. They might have been nearly impervious to ice pressure in this region. Damage to Erebus seems to have been inflicted long after it sank, possibly by the keel of a pressure ridge, for its wooden deck timbers and internal furniture did not float away because it had been waterlogged by long immersion before being torn off the structure of the ship. That being said, the one available sonar image of Terror does seem to be distorted, however that may be an imaging problem. Until we know more, I believe it is still possible that they drifted unmanned to their current locations, filled with water slowly and sank when the ice melted. I agree we still need to know more. The Oo-na-lee testimony comes from nearly a decade after the events -- the Erebus could have been forced up on land after the wood was waterlogged, then sunk back again. And I can't conceive of either ship drifting to where they ended up; I know that Ryan Harris (who knows the exact location of Erebus) is almost positive she must have been sailed to the spot. Both ships might have randomly drifted to well-protected areas. They could have kept drifting, possibly for years, until they became trapped. Like drifting snow that collects in the lee of obstacles where there is little wind. If this is so, there should be little damage and no bodies. Not even the big man with long teeth. I really think you guys are missing the forest for the trees. Remember seeing the drawings of the HMS Terror from members of the crew of the Antarctic expedition? The Terror was lifted completely out of the ice and lay on her side until the thaw. I think this is exactly what happened in Terror Bay. The native peoples did not distinguish as we do between the ice and land. To them it was beached on land- but was actually sitting just as it is now only forced out of the ice and resting on the surface before gradually sinking the following summer with no crew to empty the bilge. I have read your post Russell and wondered did the Inuit actually witness the Terror sink, or just hear about its sudden demise from the survivors? 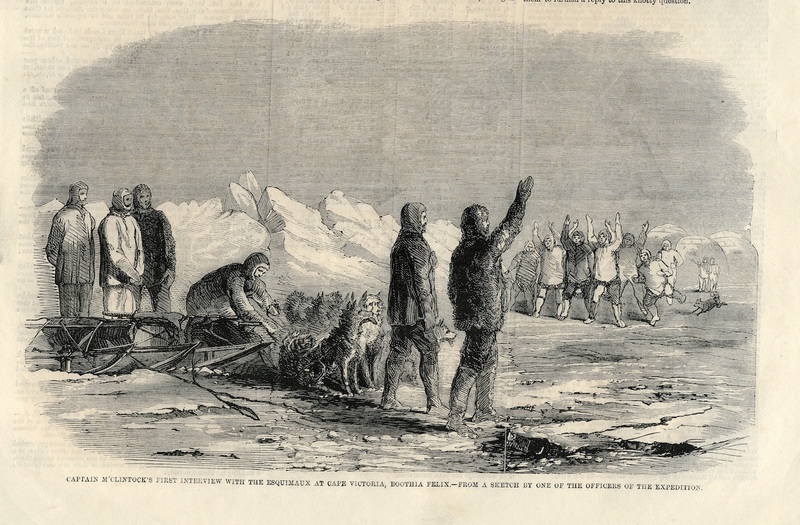 There is the oft repeated story of the survivors marching along and coming into contact with a native hunting party on the ice. There was the pantomime of the ship being crushed. That incident would suggest that at least some or all of the Inuit didn't know of the crushing of the ship. One wonders then how many different groups of natives they interacted with, and how many of these different groups knew different parts of this story. With the value of the salvage from the Erebus enough to keep the info "private" between groups of Inuit? Given the vagaries of translations, it's a wonder we "know" as much as we do. One thing that came to me reading your summary was that it would seem both ships crews headed to the Fish River, perhaps at different times, from different starting points, and perhaps with different numbers in their respective parties. It would appear then that they only left the ships for good when no other avenue was open to them. The Terror suddenly sunk, the Erebus damaged by either ice or grounding. They must have left some records somewhere....but perhaps cleverly disguised. They must have found Simpson's cairn empty, and known that such landmarks could attract the "wrong" attention for their own records. What form such caches would take is beyond me, but if they did so, would have to be in a form only European eyes would clue in to. A final thought...I wonder if the graves at Terror Bay and the hospital tent there are testimony to the conditions they endured after the sinking. The encounter and the 'pantomime' is that with what Woodman calls the "four families" -- there'a long chain of descent for that story, which was retold to Rasmussen in the 1920's. But the account by Kok-lee-arng-nun is that of an eyewitness to the sinking. Petersen started out life as an ordinary sailor, and I don't think he had a great deal of schooling; on the other hand, he seems to have been a capable man in many other respects. Ommanney spoke well of his understanding more easterly Inuit ("he seemed perfectly acquainted with their language and they equally well understood him"), but I haven't found anyone commenting on his English skills as such. "there will be bodies". I forgot to comment on that! The death march body count has always seemed low, but if one considers several of the crew went down with the ship, it could help account for the low body count to date. What state would the bodies be in? I know there are several factors such as oxygen content of the water, salt vs fresh, temperatures etc. Any possibility of "soft tissue" surviving? I just thought perhaps it could be tested for various diseases etc which could possibly explain the death tally which was high even at the time of the Victory Point message. What a contrast.....the testimony I read said the sailors left the Erebus and the Inuit found an abandoned ship (albeit with a body). The Terror would almost be a time capsule of ship life during a moment of terror. I wish more on site info were available!!! Hi Don. I hope we'll hear more from Parks soon! I base the claim of bodies on the Inuit testimony, which in its main points has been proven true again and again. Not sure about soft tissue, but in relatively shallow, very cold, low-oxygen water we could expect a relatively good state of remains; even if long-skeletonized, odds would be better for DNA from teeth and other methods of identification. I was mulling random thoughts around today at work regarding the irony of the Terror being found in Terror Bay. Just around the corner of the island is Erebus Bay, which is, I believe, the location of the Boat Place. The abandoned ship's boat was found pointing back toward the place of abandonment noted in the Victory Point message, as though they were retreating to that location. Others believe it was used to convey goods and items between a ship and shore as the Inuit said of the Terror Bay camp. Could the Erebus and Terror have been separated at this stage? Given the fickle nature of the ice, could the Terror have got past the SW corner of the island (Graham Gore peninsula) and the Erebus stuck at what became Erebus Bay? Would that account for the two encampments? And if so, what are the odds that each Bay was named for its own particular ship? If that is so, it still doesn't answer why some were left behind when the Erebus sailed on.....unless the ice opened up so suddenly the ship sailed on with a skeleton crew, leaving the others to make their way to Terror Bay as a fallback position? I realise I'm getting ahead of myself with speculation, but I keep turning over these puzzle pieces in my head hoping to fit them all together in a more complete narrative. It's a fascinating new set of enigmas. Certainly the proximity of Erebus Bay and Terror Bay is suggestive; a shortcut across the Graham Gore peninsula places them only about 60 km apart. Could each ship have been in its eponymous bay (Erebus in Erebus, Terror in Terror)? We'll probably need to wait until some kind of written record(s) are recovered from one or the other vessel before we can get a clear timeline. The reports said that in a food storage room there were plates and one can on the shelves. In addition, windows at the stern were intact. This does not sound like a ship where the ice had turned the "vessel down on its side", in addition to "crushing the masts and breaking a hole in her bottom". Although it's possible that plates and a can could remain on a shelf if the shelf was tilted backwards, it is more likely that the ship remained substantially level before and during sinking. As for suddenly sinking, it is not necessary for a ship to be overwhelmed by ice to sink suddenly. All wooden sailing ships leaked and collected rain and melt water, and if there was not enough labour to pump out the water then a point would come when the ship became low enough in the water for the sea to find an easy way in, and then the ship would sink very quickly. Hi Robert, I would just say that, in the limited imagery we have so far, there's nothing that offers direct evidence either way about the Inuit account of a sudden sinking (and only one of the witnesses has the details about the ice turning the vessel on its side and crushing the masts). I'm happy to be proven wrong -- a careful examination of the hull should provide fairly clear evidence -- but until we have more details, I think the Inuit accounts seem pretty consistent, and have been largely proven accurate so far. Didn't the TERROR already sustain considerable damage in an earlier expedition or perhaps during its service in the War of 1812? Might be a factor as to its structural integrity with Franklin? Yes, she was badly damaged during George Back's expedition and just barely limped home; the stern suffered severe damage. However, she was completely repaired, so I don't think it would have been a factor in Franklin's expedition. It will be interesting to see that part of the ship, all the same. In the vacuum of info since Terror was found, I was lucky to find a news story says Parks Canada divers have been to the wreck but the currents clouded up the water making for near zero visibility. But still no word.....and the silence is killing me! Sadly the article also touched on the politics of it all in that Parks Canada has so far only said "potential" find of the Terror and not acknowledged the Arctic Research Foundation as yet. I hope these issues don't stand in the way of researching the wreck. That story of the desk with open drawers is just to vital to get lost in any bickering! There was a picture with the article of the sunrise over Terror Bay, and it makes being crushed in the ice aboard ship seem like the furthest thing from your mind. Hang in there! Parks has a press event scheduled for Monday at 1 p.m. -- I expect we will hear much more then! Long ago, I used to fly to Chantry Inlet with my floatplane, and I've always been obsessed in what had really happened to Franklin's men. I never believed they'd died on the "Fish" River--maybe some, but surely not the whole crew. What's more, I was always very suspicious of Hobson's and McClintock's supposed discovery of the "Admiralty Form." Some things just didn't make sense, and now we know why. The ships were never where they were said to be, and the form was nothing but a forgery about things that were never true. It's time for a handwriting expert to research who might have written the big fat lies about where the ships were iced in, when Franklin died, and where the captains and crew were truly headed. I read that the handwriting on the form was studied to verify that the writing was that of Fitzjames and Crozier and that analysis did confirm it was. It is possible the location given on the form is accurate for the date on which the note was written. That doesn't mean the ships stayed there, as apparently they did not. Where do you think they were headed? And why would they lie about Franklin's death date? I think what was false about the Victory Point record was that it wasn't, in fact, the expedition's final statement. It was McClintock's taking it as such that led to a century and a half of the mistaken assumptions that they never returned to the ships, and all perished in the year the note was written -- both of which are almost certainly incorrect. They doubtless left other records further south, but these were destroyed when Inuit took and repurposed the valuable metal in which they were encased. I wonder about the supposed burial vault of Franklin. The accuracy of the Inuit testimony seems to give more and more plausibility to the existence of this. The fact that Franklin's Guelphic Order was found makes me think of two possibilities. Either it was held by on of the officers with hopes of being returned to Lady Franklin, or it was buried with Franklin and taken from his grave. I hope the medal wasn't taken from his grave as that leaves open the possibility that it is still there untouched. I have read some accounts where the Inuit witnessed what were burials (complete with musketry salutes), but I didn't think there had been contact with them at the time of Franklin's death? I thought that came later as the expedition moved south. I know people have sought the grave near Cape Felix, and Victory Point. I have wondered if it was located at Franklin Point (named for him, so it would be fitting) or even Cape Jane Franklin so he would be laid to rest at a location named for his beloved wife. Of course if it was that obvious, someone would have found it by now. Dave Woodman thinks that the burial of a senior officer, complete with musketry salute, took place at Terror Bay. There was also, at one time, a sizable cairn there, and a camp of some size with graves. Now that we know the Terror was nearby, this site ought to get fresh attention. news about Franklin, the message goes on to say 24 officers and men had died, Captain Crozier was now in command, and 105 survivors were heading for the Back River. —Why there, and what does that get them when you study the geography? That’s out of their way, presuming they were making for Great Slave Lake where the nearest help was located. Could they have been headed for Hudson Bay instead, but then why didn’t they say so? Last but not least, the thing that jumps out at me the most is the second message is written in a big circle on the margins of the form. Very strange. Why don’t you just flip it over and write on the back, which is what most people would do? Want to find Franklin's men? Draw a line from Terror Bay to the old Hudson Bay Post on Great Slave Lake. All starved to death on the Barren Grounds, and that's where their bones will eventually be found. The Admiralty form actually says that the ships were "deserted", not "abandoned". There is a big difference in the meaning of the two terms. The idea that the ships were abandoned comes from the idea that they were on their last legs and trying to get to the Hudson's Bay fort on Great Slave Lake via Backs Fish River. But there is no evidence that was their intention. They could simply have been going to Backs Fish River for the spring and summer season because there would have been much better hunting and fishing in that area. If scurvy was a problem by that stage, then they would have taken everyone because it was known that fresh food was a cure. It also doesn't preclude parties returning periodically to keep an eye on the ships' locations in case they were freed from the ice, and it seems now that this is the more likely explanation. After reading the descriptions of the interactions between Inuit and the sailors, it seems a long term and good friendship developed. Camping beside the ship(s) would indicate each party had "good neighbours". Upon the sinking of the Terror though, what happened to the friendship? Did the Inuit suddenly take their leave? Did they take in some survivors? Were those who survived the sinking suddenly finding themselves ashore with little in way of supplies? If search parties were able to interview witnesses to this event, did they not ask "what happened next?" It seems there is a gap in time from witnessing the sinking, to finding the abandoned camp and collapsed tents.